Another one I did for my magazine. 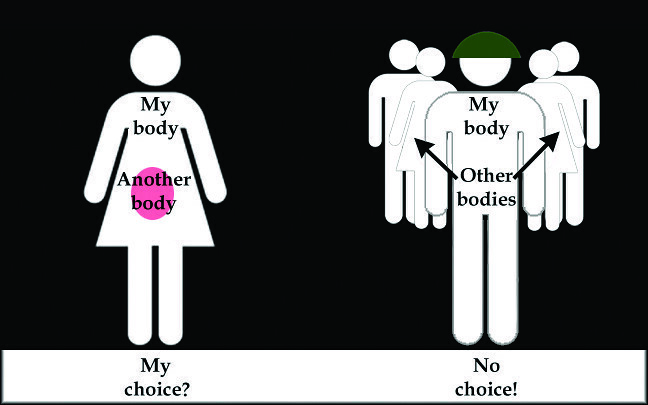 Pro-abortion advocates argue abortion must be legal because it is unacceptable for women to lose control of their bodies, which they would if they were, after becoming pregnant, forced to carry the baby to term. What is forgotten here is that men have in the past, when it was a matter of life and death, also lost control of their bodies, being drafted into the military, and sent to defend their country. What would be unacceptable normally, in life and death situations may become necessary. So the real question, then, is whether abortion is a life and death situation. Or, to put it another way, it comes down to "What are the unborn?" If they are human like you and me, then this is a life and death situation. If you would like to use this comic in your publication you can find out how to get a one-time use permission for just $10 US by clicking here or by clicking on the "Buy Cartoons" tab at the top of the page. After you've made the $10 payment you can download a higher resolution image of this comic here (right click the image to download it).